If you’ve been to Caputo’s Market or taken a Caputo’s class lately, you’ve probably noticed a bump in tinned seafood visibility and pairings. We love tinned seafood, the culture it represents, and just how delicious it is. In a landlocked state like Utah, we’ve found a now easily accessible, and incredibly sustainable, way to include seafood in our daily diets. Meet the newest addition to this burgeoning category: Ittica Alimentare Salerno (IASA). Campania may be most well known for their cheese, but the miles of coastline along the Tyrrhenian Sea make this region ideal for old world, inherently sustainable fishing practices. 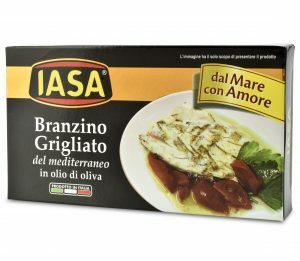 IASA (Ittica Alimentare Salerno) is at the forefront of the industry, combining tradition and attention to detail with innovative preservation techniques and high quality selection. Mediterranean branzino and dorade are line caught April through September, grilled or steamed, and hand packed to mimic the texture and flavor of freshly caught and cooked fish served by a Southern Italian Nonna. IASA has harnessed the ability to trick the mind and present a preserved fish that feels and tastes as though it’s been freshly prepared the day you open each tin. The likeness to fresh fish is uncanny and we’ve found this to be the way to enjoy a fresh tasting take on preserved seafood long after the fishing season has ended. Shop IASA and all our tinned seafood offerings at your local Caputo’s Market or buy online here.